Since its founding in 1977, Friendship Trap Company has worked closely with lobstermen (and women) to refine the art of trap building. Innovation, quality and service have earned us a reputation for providing traps that are Built the Best, Built to Last, and Built Your Way! With a staff of seasoned veterans on our production floors, and key leaders with over thirty years experience building traps, you can depend on quality craftsmanship from Friendship Trap. Add to that the many innovations developed here over the years, and you get the best lobster traps in the industy. 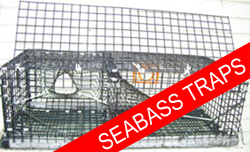 Our "Rockbottom" line of inshore and offshore lobster traps with built-in, specially-formulated concrete ballast runners have the greatest structural strength available in a lobster trap. They are maintenance-free, and because they require no other ballast, the trap is clean and free of obstructions that might slow you down when hauling. 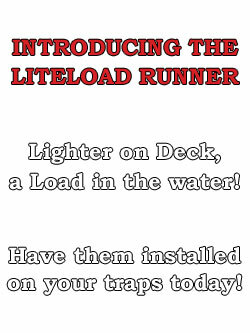 The recent addition of our LiteLoad runners and wedges provide products that are "light on the boat, but a load in the water." Made in Maine, LiteLoad runners have a steel core coated with a rugged polymer. LiteLoad wedges are hot-dipped galvanized, vinyl-coated steel trap ballast blocks, designed for easy installation. Both are built to last long and maximize the weight of the trap on the bottom while being light on deck, making handling traps easier. We at Friendship Trap Company continue to invent and craft new products to insure you have the best equipment to maximize your catch. Customers have told us that they couldn't build a better trap themselves! You will never find anything but the very best material in a Friendship Trap. The temptation to cut corners to save a buck when making a lobster trap is great, but when you consider the cost of repairs, lost fishing time and early replacement, the lifetime value of quality becomes clear. Additionally, we test many of our components to levels well beyond typical use to ensure they will stand up to the extreme demands of the North Atlantic. You can count on Friendship Trap to deliver the greatest value over the long life of your trap. The first step in making sure traps are Built Your Way is an understanding of what you actually want. With the industry's only full-time field sales representative, and well-positioned locations both in the Mid-coast and Downeast, we are committed to actually being able to talk to you face-to-face to insure we get it right. Our precision order process insures regular on-going communication between you, sales, production, dispatching, and all the way through delivery to make certain that you get what you want when you want it. Your traps are built in our own factories, not farmed out to other trap builders, resulting in better communication, less variability and fewer opportunities for error. Our service includes delivery from coastal Canada to the mid-Atlantic. We pride ourselves in meeting your special needs, and we love it when a customer comes back with a trap that they purchased 30 years ago from Friendship Trap wanting us to make another set just like it! If getting it Your Way means you want to build it yourself, we will happily provide you with custom-cut wire kits and all of the accessories that you require. Probably the greatest benefit to getting your traps built your way is that it enables you to maximize your catch. Our customers experiencing the most success tend to be those who are seeking to continuously improve their gear. They understand that catching more lobster in each trap far outweighs any incremental cost to get their traps just right. You may put a lot of money into your boat or other gear, but it's when the lobster meets the trap that all of your efforts turn to cash! Friendship Trap specializes in helping you get your traps just the way you want them. The lobster industry faces a lot of challenges - shifting seasons, whale rope protection rules, increased bait and fuel prices, lobster market issues, and more. Because our livelihood is inseparably linked to the lobstermen, we share those challenges. Therefore, we are committed to providing you with more efficient, maintenance-free lobster traps with the latest innovations to maximize your bang for the buck. Our customers, the best lobstermen in the world, know how to catch lobsters. We know how to build the best custom traps they require. Trust Friendship Trap to make YOUR traps!